"The large and marvelously restored home has Victorian flourishes ...Gracious and friendly... The breakfast is a gourmet repast". "The rooms are handsomely decorated...The Hydrangea Suite with a sitting room and French doors is one of the better rooms you will find at a B&B". "Wow! What a great Bed & Breakfast! One of our best. The food was excellent, you two are so friendly, feels like we have known you forever"
"Once again, your hospitality was unsurpassed. We feel so comfortable and welcomed in your lovely home." "Every detail, every morsel, every moment was perfect.. and you two are the icing on the cake." "You made our trip to Saratoga a great success. Your hospitality, warmth and friendliness will never be forgotten. We will be back next summer for those pancakes!" "Lovely home, gracious hosts,wonderful food. Hurrah!Thank you, Thank you!" The Circular Manor was built in 1903 by William Case, a prominent contractor and lumber company owner. The Manor's front entrance foyer reveals a magnificent example of Mr. Case's involvement in the lumber business. Quarter-sawn oak archways, columns, stairway banister and floors are complemented by the present day warm and youthful Victorian decor. The home was designed by R. Newton Breeze and is a combination of many styles. While the building is mainly Colonial Revival in style, its Queen Ann-style circular porch is a prominent feature of the home and is thoroughly enjoyed by summer guests. The Case family was well known in Saratoga Springs for their social engagements. Discovered during the restoration, were several original society column newspaper articles describing the opulent social gatherings of Mr. and Mrs. Case. After the death of Mr. Case, Mrs. Case sold the property in 1923 to two sisters, both registered nurses, who operated the home as the Viasana Convalescent Rest Home. In 1946 the home was sold to Moses and Francis Stein who used it as their residence and rented rooms to visiting tourists. In 1977, their son Max Stein, a prominent Saratoga Springs accountant, took over the operation of the 12 bedroom guest house with his wife Miriam. The guest house was then known as the Circular Lodge. The building stood vacant for several years before Dieter & Michele Funiciello purchased it in 1996. After three years of passionate and meticulous restoration, the Funiciello's opened their residence as the Circular Manor Bed and Breakfast Inn. 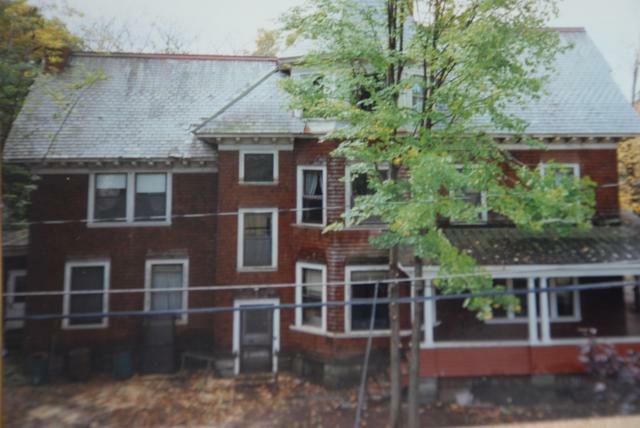 The picture below was taken in October, 1996, two weeks after Dieter and Michele purchased the dilapidated home.Twelve large trees and overgrown brush were removed from the property and for the first time in 15 years, neighbors got a full view of one of the last unrestored homes in Saratoga Springs' Historic District. Since then, the Funiciello's have received numerous awards for the restoration, landscape design and historic preservation. The home has been featured on HGTV Network's "If Walls Could Talk" and was twice featured as a home in the Saratoga Preservation Foundation's Candlelight House Tour. When Dieter and Michele look at this photo now, they have been known to say, "Thank goodness we were young and naive enough not to know what we were getting ourselves into!"